Cancer Research UK's ' R UV UGLY?' 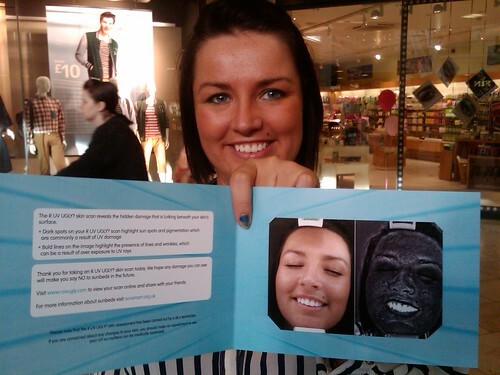 photo booth shines light on sunbed use in the North East. The charity's campaigns been in the North East to urge shoppers at the MetroCentre to face the invisible damage inflicted on their skin all in the name of having a tan. The campaign aims to raise awareness about the skin damage, premature ageing and health dangers of using sunbeds. The North East is being targeted due to its high concentration of sunbed outlets. In Newcastle alone, there are over 50 outlets, which equates to around 21 sunbed outlets per 100,000 people. That means the city has one of the highest concentrations of outlets in the country. The 'R UV UGLY?' roadshow is offering Metrocentre shoppers exclusive free skin scans via a custom-built, state-of-the-art photo booth. Equipped with specialist skin-scanning technology, the photobooth will give visitors a close up of hidden damage lurking beneath the skin's surface caused by over exposure to UV, both from sunbeds and the sun. After being 'snapped' in the booth, visitors will be able to take their skin scan portrait photograph away, along with specialist advice about the results. Rates of malignant melanoma - the most serious form of skin cancer - have tripled amongst 15-34 year olds in the North East since the mid 1980s. Around 40 people in this age group are now diagnosed with the disease every year. Not only do sunbeds make you look old and wrinkly before your time, figures worryingly show that using a sunbed for the first time before the age of 35 increases the risk of malignant melanoma by 75 per cent.